Neil Gaiman’s Odd: I love him. Forgive me, readers, for two things. One, for being absent for so long, and two, for being self-indulgent and explaining away my absence. Humor me, it’s relevant (sort of). Toward the end of the summer I took a new job and simultaneously, somehow, and totally on purpose, I found myself knocked up (no oops there, but I do wonder at my timing). So between the working, the throwing up, the commuting, the being exhausted and the studying for the MBA which suddenly seems much less important, I haven’t had time to crack a book for enjoyment since. This, I have discovered, is a very unhealthy place for me to be. My body is having a hard enough time keeping down food (like some women, I’ve lost weight in my first trimester). This is no time for my soul also to be lacking in (literary) nourishment. This baby may not end up being a reader, though with nature (on both sides) and nurture (on all sides) I don’t see how that will be possible. Regardless of how he or she turns out, it will not be from lack of a steady diet of stories. 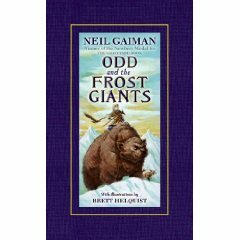 It is fitting and perfect and glorious that Neil Gaiman’s Odd and The Frost Giants, about a boy named Odd and his adventures, was the book that broke my reading fast. He is the storytelling equivalent of Thanksgiving, but without the uncomfortable food coma. His books are warm comfort food. They are always satisfying and hearty, even if the volume is slim, as this one is. His stories are tasty and spicy and savory. And sometimes, as in this case, they finish sweetly, with everyone receiving just desserts. Mr. Gaiman’s stories seem so effortless and so perfect; I defy anyone not to adore them unequivocally. It is always with sadness that I finish one of his books. I read this one too quickly on a train ride home. I was so unwilling to let it go that I was forced to read the author’s biography at the end. Do I really need to do this? No, I’ve read all his books. I know more about him than a little blurb in the back can tell me. But I’m so glad I read it. I have often said I would read a cereal box written by Mr. Gaiman and I laughed out loud at the following parenthetical messages left in this book’s biography — the majority of which was hilarious in its own right — thus proving that I am right to think he can make anything worth reading. So, I’m back in the world of reading, moreover of fantasy, that cure-all for real world burdens. I can’t wait to read these books to my baby. In fact, I’m not waiting, I only hope that she can hear me through some baby-mother channel. We both need stories, and hope that a love of reading is something that gets passed down from both her parents. Without a doubt, she’ll probably be the only kid quoting American Gods at daycare. I loved Odd, too. And Coraline. And Nobody Owens. I don’t know how he does it, but he makes these kids so grounded and self-possessed. While it is true that they have to endure more than the average child, he also makes them realistically, well, kids. I can’t get enough of him. « Butterfly in the sky. . .no more.